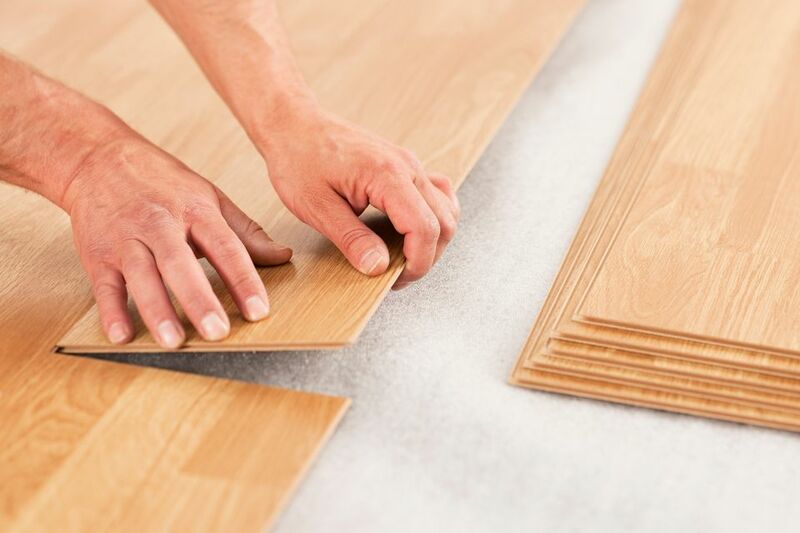 Because laminate flooring is thin and constructed of fiberboard rather than solid hardwood or even plywood (as with engineered wood flooring), underlayment is usually recommended. Laminate flooring underlayment is a niche product designed only for use with laminate flooring. It is not the same product as the thin plywood underlayment that is sometimes installed under vinyl or tile flooring. Rather, it is usually a lightweight polyethylene foam or heavier closed-cell foam that rolls out in overlapping, 44-inch-wide strips. Alternatively, some homeowners prefer to install thicker and more expensive felt underlayment for better sound absorption and a softer feeling under foot. Flooring manufacturers typically specify that you install underlayment before laying laminate flooring because the laminate boards alone do not supply all of the properties required of flooring. But laminate underlayment does have its plusses and its minuses. While laminate underlayment usually is a safe, default choice, there are a couple of instances when it is not necessary. Laminate flooring is so thin that it needs underlayment's extra help to feel and act like real wood. Consider the issue of sound transmission. You do not need foam padding under solid hardwood for many reasons, one reason being that the thickness and density of hardwood limits the transmission of sound, both within the room and to floors below. Laminate flooring has neither thickness nor density: it is usually no more than 12mm thick and it is made of a type of low-density fiberboard. As a result, underlayment boosts laminate's sound absorbing qualities. Subfloor imperfections mean that your subfloor is not perfectly flat and featureless. Subfloors exposed after the existing flooring has been removed are a veritable battleground of nail holes, pits, gaps, grooves, and splinters. Even new subflooring, due to its seams, can be less than perfect. Solid hardwood or engineered wood can easily bridge small gaps, running directly over imperfections without the need for underlayment. Even ceramic and porcelain tile can bridge a few small holes and gaps, plus mortar works to fill them in. But laminate flooring will eventually telegraph subfloor imperfections. Underlayment helps to prevent laminate damage. You will need moisture-proof underlayment when there is a chance of moisture migrating upward from a concrete slab, tile, or cement board. Even a wood subfloor or flooring over a crawlspace or other non-climate-controlled space can be subject to rising moisture. Common foam underlayment will inhibit moisture, but there are types of underlayment that require a separate 6 mil. polypropylene vapor barrier. When you are installing on top of hard surfaces such as concrete, you may want the extra padding that underlayment provides to make it softer to walk on. Wood subflooring has enough flexibility that underlayment will only slightly soften the surface of the laminate. But concrete, brick, and other forms of masonry practically demand the softening qualities that underlayment brings. Generally, you will want to use underlayment under your laminate flooring. However, you might want to consider not installing underlayment in a few instances. Pre-Attached Underlayment: The only instance when you absolutely do not need underlayment is when the laminate flooring already has underlayment. Your laminate might already have pre-attached underlayment, rendering separate underlayment unnecessary. A rare feature only a few years ago, laminate with pre-attached padding is now found in great numbers. Over half of Lumber Liquidators' laminate floors come with pre-attached padding. Over 75-percent of Pergo's laminates now have pre-attached underlayment. In this case, not only is separate underlayment unnecessary, it is detrimental to the stability of your flooring. When you have pre-attached underlayment, manufacturers recommend that you still install a vapor barrier. Cost: Laminate underlayment can be surprisingly expensive. Premium underlayments specially designed to mitigate sound can represent a large portion of your flooring bill. If you are installing in an area that does not physically need underlayment and cost is a major issue, you can ostensibly get by without installing underlayment. Dry Base: One popular mode of installation is to put laminate on top of vinyl flooring. This eliminates the need for removing the vinyl floor. Vinyl flooring is not--or, should not--be water-permeable; if it is, somebody installed the floor wrong. Even hastily-installed peel 'n' stick vinyl floor tiles can do a reasonably good job of holding back the moisture. Solidity: Foam laminate underlayment softens your footfall. But it also makes the flooring feel hollow. You notice it immediately when you walk from a solid surface, like tile, to a laminate floor with underlayment. It is a singular feeling that alerts you to the fact that you are on laminate with foam padding. Laminate flooring with denser felt underlayment more closely approximates the feeling of real wood flooring. Perfect Base: Ripped-up flooring causes subfloor problems. Tile leaves behind chunks of mortar. Vinyl leaves adhesive. This mess often welcomes the assistance of underlayment's smoothing, bridging properties. When your subfloor is new, flat, and featureless, with absolutely no protrusions or gaps and importantly with perfect seams, this subfloor may not need the assistance of underlayment to make your laminate flooring lay perfectly. Freshly installed OSB or grade-A plywood provides a smooth, perfect surface for laminate flooring installation.